So I must admit, I have a problem of letting things go and trusting God to take care of me. You could even ask my wife. Aside from “I love you” and “Can you help me with this?”, it’s probably the thing my wife tells me the most. When times get rough, it is the most important thing for us to remember, but the easiest for us to forget. 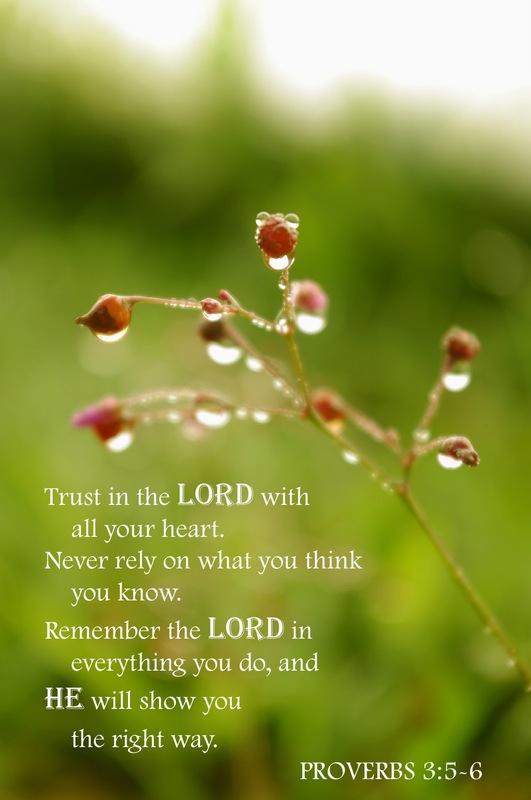 It seems to me that most people when they have trust issues with the Lord get referred to Proverbs 3:5, “Trust in the Lord with all your heart and do not lean on you own understanding” (NASB). This really is a great verse from a great book. Solomon is trying to help us become wise. The reason we cannot lean on our own understanding goes back to our sinful nature. Even though we want to follow and obey God, our bodies and minds have an inclination to trust ourselves and put us above God. I tend to say a lot “I can fix this” or “How can I help?”. Statements like these are not inherently bad, but I don’t see much room for God to act in them; they are very me-centered. But when I have to hardest time in trusting the Lord is when my family is having financial difficulties. I recently decided to re-read Isaiah. I found a verse that helps me more than Proverbs does, “If you will only obey [God], you will have plenty to eat” (Isaiah 1:19 NLT). I read that and thought to myself “ain’t that the truth”. There’s even a story about that in the Bible. In the Exodus 15-16, God decides to provide water, manna, and quail for His people. God’s instruction was for them to eat all of it in a day, and when they didn’t, it was rotten by morning. I’m reminded of a song by Kristian Stanfill called The Lord Our God. The lyric in my mind says “Our provision through the desert”. It’s a reference to the story in Exodus. God will provide for us. Today, He is asking us, through the words of Isaiah, to obey Him and He will provide for us. So simply trusting God is necessary for our lives. And trusting Him through our rough times is even more important in our lives. I get stuck thinking I have to be the provider for myself and my family, but the truth is that God is that provider. Yes, he works through me for the provision, but it is ultimately Him that is the provider. So place your trust in Lord, and let Him help you through the days of your life. UPDATE: I also thought of this hymn while I was driving today. I had heard a somewhat Jazz version of it while shopping at Hobby Lobby, but I thought that it would fit with this post as well. I thought this was a pretty good arrangement of this hymn. Previous Previous post: Mindless Reading?